One question commonly asked is, "How is this product different than the regular Eniva B Complex?" When the body digests protein, homocysteine is produced. Homocysteine is an amino acid derivative of protein metabolism. How does Homocysteine work in my body? Necessary cofactors are needed to break down and metabolize homocysteine. The necessary cofactors are Folic Acid, Vitamin B12 and Vitamin B6. These nutrients all play a role in the regulation of homocysteine in the body, converting it to substances, such as methionine and cysteine, which do not interfere with normal vessel function and health. Increased doses of Vitamins B12, Vitamin B6, and Folic Acid have been shown in clinical studies to support healthy levels of homocysteine in the body. What are healthy Homocysteine levels? The American Heart Association™ has indicated a reasonable goal should be less than 10 micromoles per liter. Other research suggests that optimal homocysteine levels should be less than 6 micromoles per liter, especially in high risk individuals. Ingredients: Purified water, natural flavors, sorbic and/or benzoic acid(s) (protect freshness), pyridoxine hydrochloride, inositol, malic acid, citric acid, xanthan gum, l-methylfolate calcium, methylcobalamin, broccoli extract, pomegranate seed, grapeseed extract, stevia leaf extract. Directions: 1-2 servings daily (15-30mL). Cautions: Do not consume if tamper resistant seal is broken/missing. Do not consume if allergic to components found within product. As with all dietary supplements, contact your doctor before use. If taking prescription medications, have an ongoing medical condition, are pregnant, nursing or under age 14, consult doctor before use. KEEP CAP TIGHTLY CLOSED. KEEP OUT OF REACH OF CHILDREN. Drug Interactions: Pyridoxine supplements should not be given to patients receiving levodopa because the action of this drug is antagonized by pyridoxine. However, pyridoxine may be used concurrently in patients receiving a preparation containing both carbidopa and levodopa. Concurrent use of phenytoin and methylfolate may result in decreased phenytoin effectiveness. Seek your health care professional’s advice. Other Interactions: Individuals with known hypersensitivity or allergic reaction to any of the components in the product should not consume. Do not use when there is fluid retention resulting from reduced renal or cardiac activity. Discontinue usage if undesirable reactions should arise. I can tell the results for my heart. So easy to use, and tastes good. 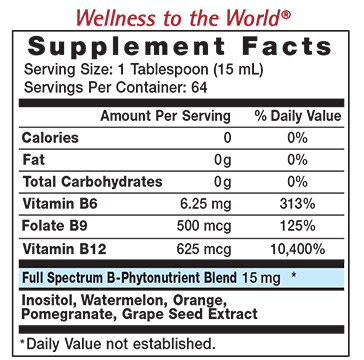 I'd tried other b vitamin products in the past but was not real happy with results. This product is way superior and I really notice the difference. Staying with this, for sure. Tried this for curculation to help my hands, toes and nose. It relaxes my system and supports blood flow. Helps my cold fingers and discomfort. Eniva invests a lot into scientific studies to prove validity of their supplements. They are liquid so more easily digestible, and gluten free. I've been on the product for just 17 days but expect to enjoy further benefits with more time. My quality of life has improved by taking Eniva Super B's! My brain is working so well after just 2 weeks of taking Eniva Super B's. Also, my quality of sleep is great. I will definitely continue using this product. Easiest and best way to get your B vitamins, especially the correct B12 if you are a vegan.